Paco Sánchez was born next to the San Nicholás church in a house built among the banana trees which, at that time, grew along the sides of the Guiniguada ravine in Las Palmas de Gran Canaria. When he was eleven years old, he began at the Luján Pérez School, the leading arts centre in the Canary Islands. The director, Felo Monzón, became Sánchez’s ethical and aesthetic reference. 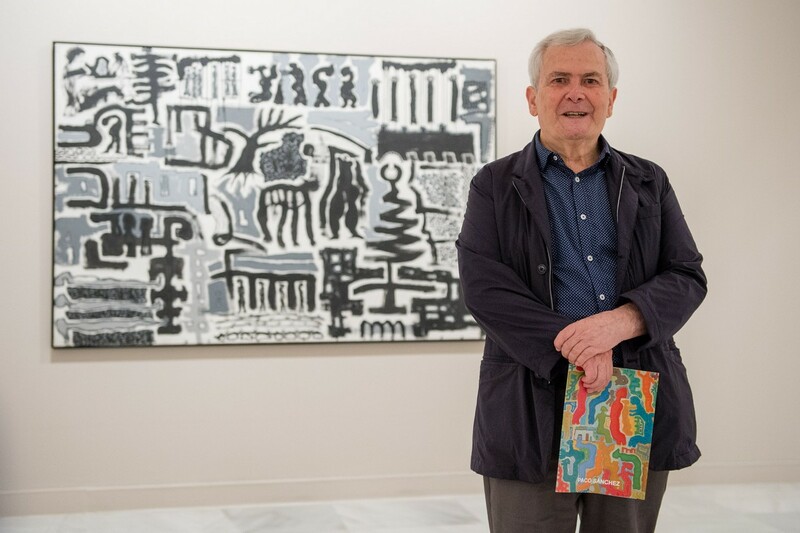 Baudilio Miró Mainou, who took the students at the school to the ravines in the south of the island to paint, also played an important role in his art work. It was here that Sánchez discovered the images that, over time, continually cropped up in his paintings: the volcano / the island; the baby goat pen (el goro) / the sharecroppers’ house (la cuartería); the branch on the dry tree / the Dragon tree; the sharecroppers with scarves tied under their chins; the lizard; the winged beings. His work conveyed a unique message and won him the 2017 Canary Islands Fine Arts and Interpretation Award. The curators have selected some ninety paintings for this exhibition, which show fifty years of art work, arranged in what we call cycles. By way of these, we intend to show visitors some of the artist´s main concepts that feature in his vast and complex range of works. In the basement of the CAAM we can see the first of them, La luz de tu Mirada, which deals with the creation of the female image between 1969 and 2008. The second, Las raíces del goro (1974-2011), reflects the foundations of the area depicted in the paintings. The third cycle, belonging to the early years, Sueños africanos (1977-2016), represents his paintings in black and white, which are vital for understanding the great leap forward that his painting undergoes in the early 80s, a period in which Sánchez joins the Generation of the 70s. On the ground floor of the CAAM we present a second group of cycles that opens in 1986 and runs up until the end of the following decade. We refer to the cycle, Danza de la alegría, in which we see the poetics we all recognise in Paco Sánchez; and the first processes towards the crystallisation of his visual alphabet: Bosque con figuras (1993-2006), on the branch of the dry tree; Figura y paisaje (1997- 2017) and Riscos (1998-2016). In the final years of the twentieth century, his painting experienced a second leap forward. Sánchez gives increasing importance to the expressive value of colour, while references taken from the history of painting become more and more common. We refer to his paintings on a red background, Mi canto es color atlántico (1998-2015), and, especially, to his cycle Ancestros (1998-2017), in which women, winged beings and terrestrial beasts begin to change into mummies, idols and totems. With Ancestros, Sánchez transfers his imaginary to the other side of the mirror of time. Alongside these cycles, we show the two most intimate paintings of his work: Lloré un río (2004-2016) and the nocturnal and extraordinary La estrella que miro todas las noches (2008-2017). In 2008 Sánchez starts with El interior del drago, a new period of work in which dance and music play a leading role. This role leads to the last cycle we present, El sonido del mundo (2015-2017), probably the most ground-breaking of his works. In it, Sánchez strips himself of all that had gone before to chart a song to the joy of painting. The object of his life. Schedule from Tuesday to Saturday from 10 a.m. to 9 p.m. Sundays from 10 a.m. to 2 p.m.